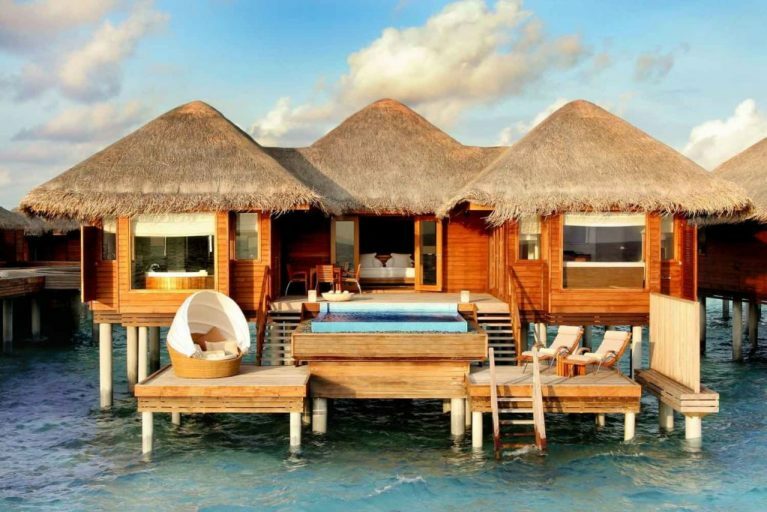 Huvafen Fushi Maldives is everything you dream about Maldives and much more. 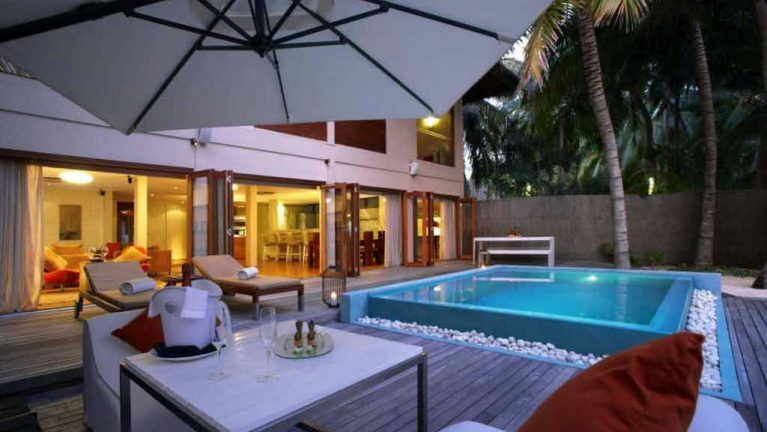 Resort is located 35 minutes away from Velana International Airport via Speedboat. Surrounded by magnificent lagoon and reef line. Enjoy your dinner beneath the stars, or pamper yourself to underwater spa; or engage yourself in snorkeling or diving or any sports. When you think about Maldives, probably the first image that comes to mind is beautiful white sand, incredible sunsets against the ocean, colorful underwater creatures and secluded beaches. 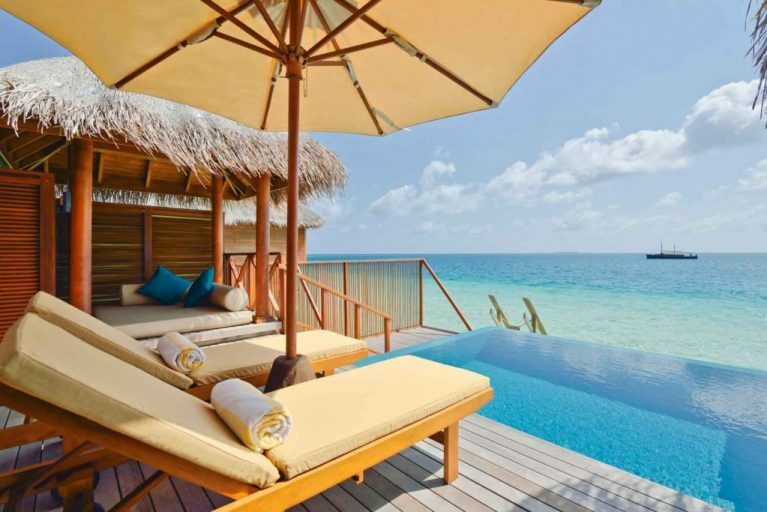 Large clear tidal lagoon and striking infinity pool extending over the sparkling waters, Huvafen Fushi is lovely. Furthermore, it has substance as well – all luxury villas have private pools, above all there’s an under water spa, and creative fine dining options. What’s more, for such a liberal resort, since it’s refreshingly casual. Time flies here at Huvafen Fushi Maldives. On your arrival to Velana International Airport - Resort representatives will be standby to welcome you & to assist you with transfers. All quotes are inclusive of both ways transfers by Speedboat & all Payable Taxes & Charges. Enter into bliss at Lime spa, one of the first underwater spa. Leave all the cares of the world as you step in Lime spa, and take relaxing hot body stone massage, couture facials, scrubs as you float under water and meet up with colorful fishes and coral reefs. Book 4 to 6 Nights & receive 25% Discount on Room Rates. Breakfast is included in the offer. Combinable with Free Half Board Offer. * For split stays a minimum of 2 nights is required in each room category. Book 7 Nights or more & Receive 30% Booking Discount on Room Rates. * Combinable with Free Half Board Offer. Book anytime and enjoy complimentary Half Board Meals (Daily Buffet Breakfast & Dinner). • Combinable with Booking Discount offer. * Complimentary Breakfast & Dinner for All Bookings. 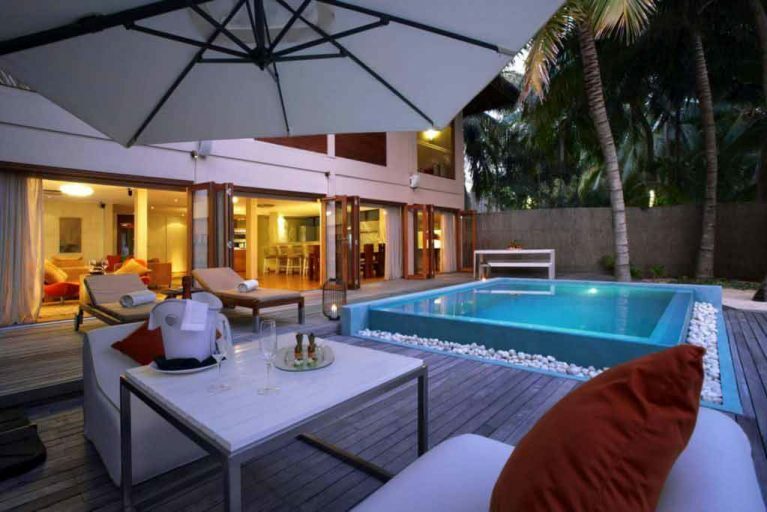 * Accommodation for 04 Nights in Ocean Bungalow with Pool. * Daily Buffet Breakfast + Complimentary Dinner 2 Adults. * Both ways Airport Transfers by Speedboat (Airport/Resort/Airport). Package price are Per Person Price for 2 Adults accommodation. Applicable Special offers are included in the package. * Packages can be modified based on your Travel Requirements. * Accommodation for 07 Nights in Lagoon Bungalow with Pool. * Packages can be modified based on your Requirements. * Free Cancellation For Bookings confirmed 45 Days Prior to Arrival Date. * Accommodation for 04 Nights in Beach Bungalow with Pool. * Complimentary Half Board Meal Plan for 2 Adults. 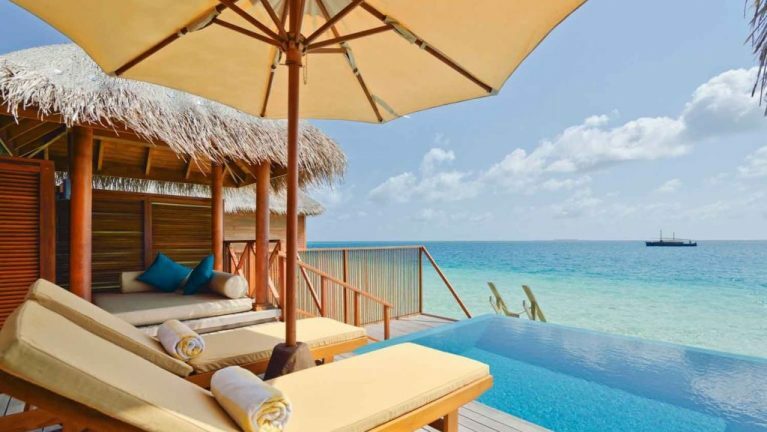 Beach Bungalow with Pool are set across the white sand beaches, with the amazing view of the lagoon and offers direct access to beach where one can soak in the sun, snorkel, dive. Comfortable large bed, luxurious deck overlooking the beach with lounges, open air bathroom with rainfall showers, 24 hrs thakuri (butler service) and much more is offered. Set over the water with staircase leading to the sea, this villa is equipped with amenities such as plasma TV, 24 hrs thakuri service , open air bathroom with rainfall showers and much more. 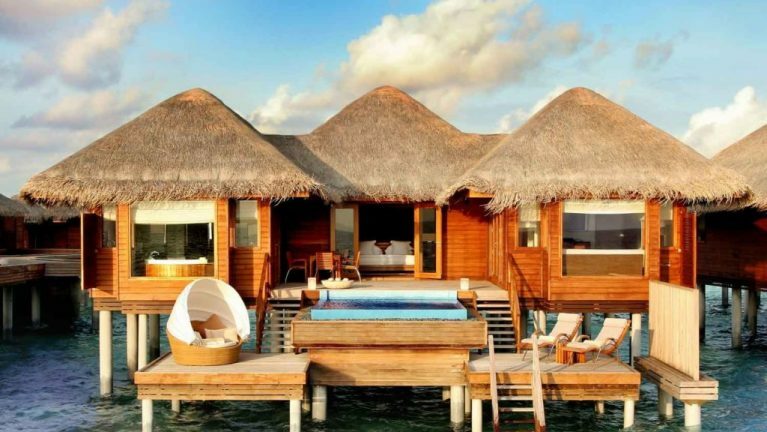 Inspired by traditional architecture, this thatched villa is airy with a master bedroom featuring a king size bed, en-suite bathroom with bathroom amenities, bathtub, shower. The outdoor deck is spacious, well-furnished a perfect place to lounge and retreat back. 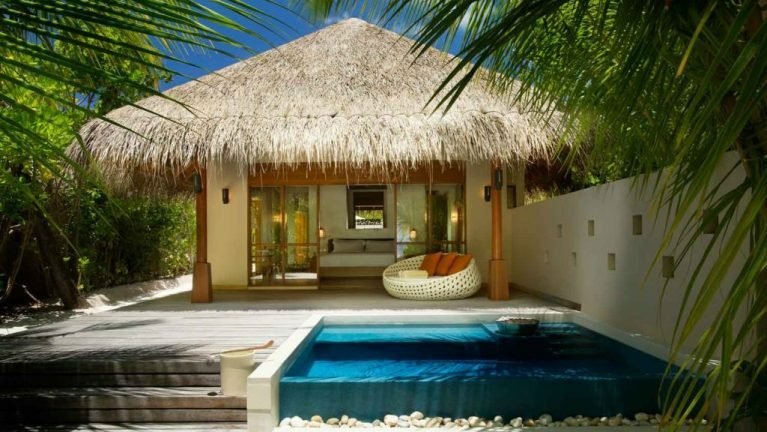 A much spacious outdoor living area and larger pool than beach pool villas, this villa offers 2 pool one facing the ocean while other set near the outdoor shower. Villa offers open-air bathroom with waterfall shower, In-room entertainment system with plasma TV, surround sound and fully loaded iPod and Thakuru – butler service and much more. The outdoor deck is spacious with swimming pool, daybed loungers, dining area and a private pool. A 3 tier private deck with an infinity pool, dining area, daybed and sunbathing terrace, this villa also has a staircase leading to the ocean. Positioned to capture the glimpse of sunset and sunrise, this 3 tier deck is playground. Indoors it has a master bedroom with king size bed, bathroom area with bathroom amenities, shower, bathtub, living area with plasma TV, sofa. Set to catch the glimpse of the sunset, this bungalow is 200 meters from the ocean; so, peace and private time with loved ones is ensured. This secluded bungalow is equipped with all the modern amenities: air conditioner, plasma TV, IDD telephone and much more. The outdoor deck is spacious with a private swimming pool, daybeds and sun loungers for enjoying the mesmerizing beauty of the ocean, staircase leading to the ocean. 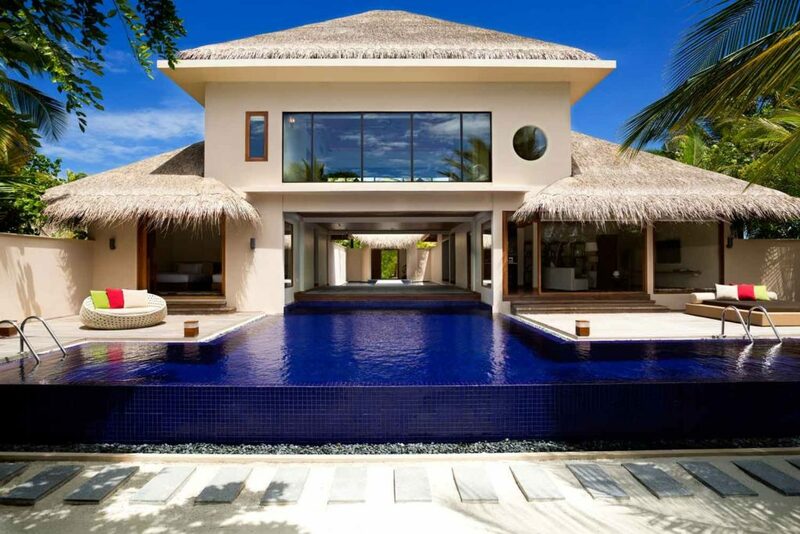 This 2 storey villa offers its own private beach, an ultimate luxury. In the first floor you have the master bed offering the spectacular view of the infinity pool and the lagoon. The second bedroom offers indoor and outdoor bathroom with rain showers. Equipped with all the modern amenities and a private butler your stay will be a definite joy. A sanctuary of its own, this 3 bedroom, 2 storey residence is sophistication at next level. The outdoor deck is spacious with outdoor gaming room, private pool, sundeck with lounges, day bed, dining table. Inside you have a 3 bedrooms, en-suite bathroom, living room, dining area with well equipped kitchen. Equipped with modern amenities 32 inch plasma TV, 2 fully stocked minibar and a private butler, your comfort is utmost priority here. 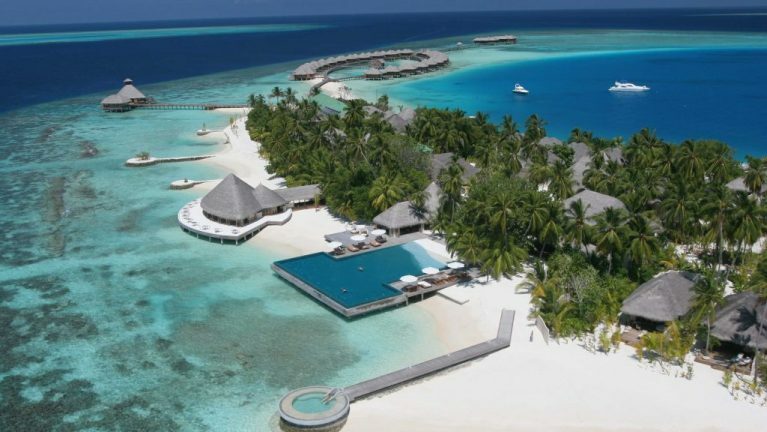 Huvafen Fushi with splendid dining venues offers world class cuisines, immaculate service, and a great ambience. The atmosphere and ambience makes the food even tastier. 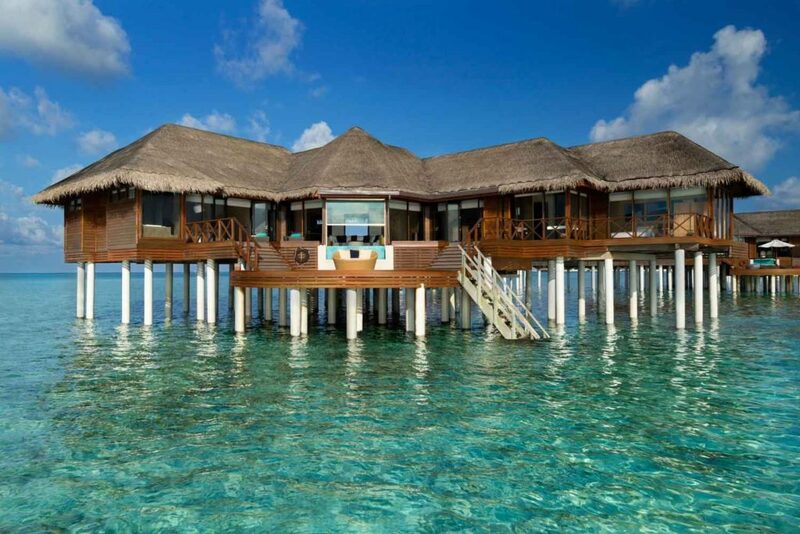 Prepare yourself to a dive into scintillating cuisines at Huvafen Fushi. Celsius An all-day dining restaurant, Celsius is set on the beach to offer guests a laid back atmosphere where one can enjoy authentic Maldivian, Asian, continental, European, international cuisines all day long. Try signature dishes, fresh lobsters with fine wine against backdrop of the ocean at Celsius. Fogliani Set beneath the canopy of coconut palms, Fogliani serves authentic Italian food to its guests. It offers an array of contemporary specialties – handmade pastas with broccoli and pea tendrils, butternut squash pizza with goat’s cheese, rocca pesto and pine nuts. At the heart of this restaurant is traditional wood fire pizza , create your own pizza with an array of toppings available. Raw Enjoy the cool breeze and sunny Maldives in this open air restaurant serving organic foods to its guests. Taste signature dishes, raw pizza, chilled tom yum with coconut flesh. Re-awake your senses at Spa cuisine raw. Salt Meet up with dolphins, colorful fishes, baby turtles as you enjoy your meal at Salt.Perched over the ocean, enjoy the coolest breeze and invigorating sounds of waves along your fresh sea food. Dine under the skies in this open kitchen restaurant from your al fresco decks. Vinum 8 meters below the ocean, Vinum is an exclusive collection of 6000 rare vintage wines. A one of a kind, taste some exclusive wines at Vinum. Umbar Music, cool tropical drinks flows all day at Umbar, the party area. Choose from signature drinks– The Legacy for two, Lychee Temptation. It’s a cool place to hang out with friends. 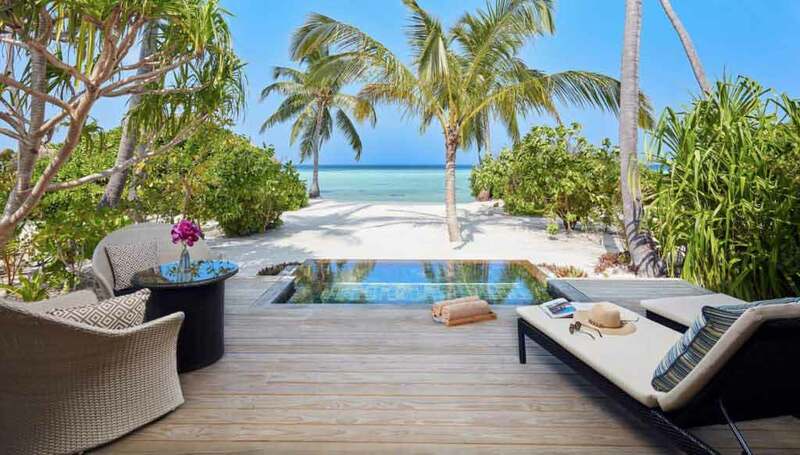 Destination dining Secluded in surreal locations with loved ones, with succulent dishes prepared especially for you by the private chef is your dream than Huvaen Fushi arranges this for you. 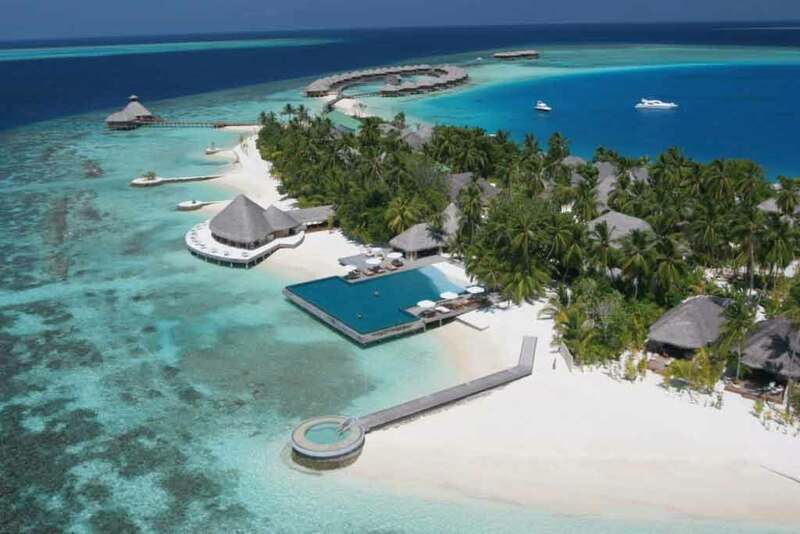 Dine under the skies, or intimate lunch on the shorelines of beach your imagination is made reality at Huvaen Fushi. 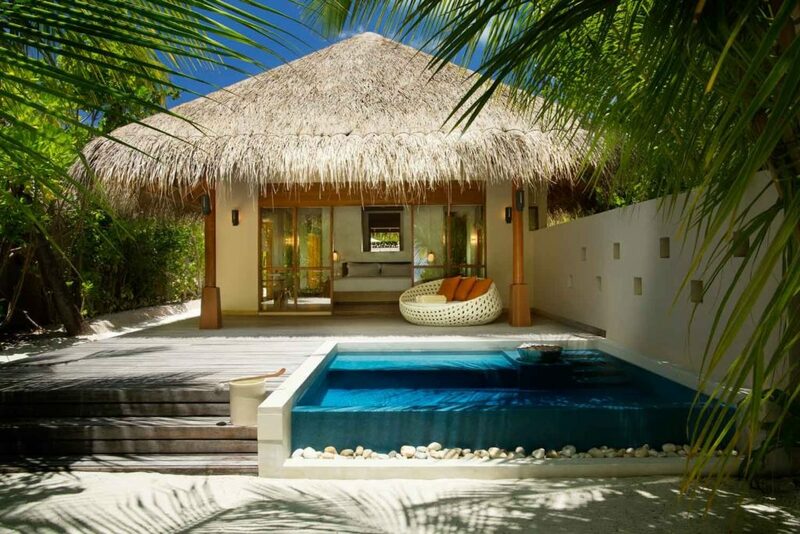 All villas with Private Pool. Top luxury Resort in Maldives.